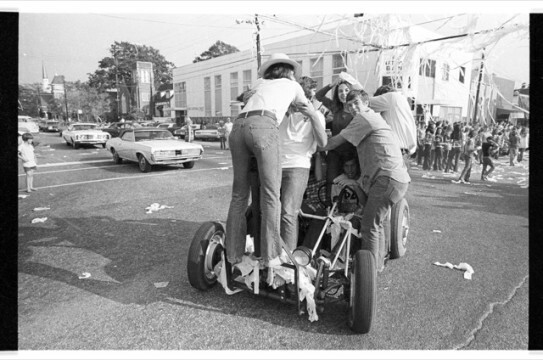 Auburn University (via its official Toomer’s Oaks update page) recently linked to photos we posted in August of one of the first times the corner was rolled to show that rollings were first confined to the center of College St. and Magnolia Ave. intersection. 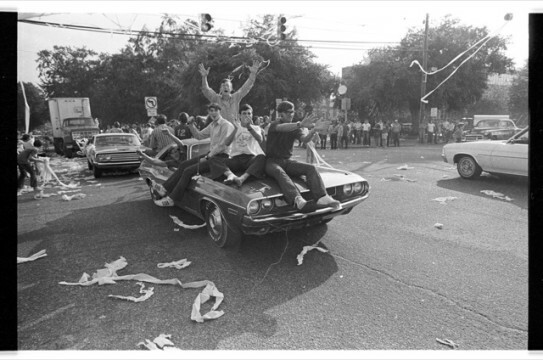 We were almost positive that they were taken sometime (before Punt, Bama, Punt) in 1972. Now we’re even more almost positive. Because we just found some more, and according to our facial recognition software they’re from the same afternoon… which according to the label on the sleeve the negatives we scanned them from were in I’m now kinda maybe certain was October 21, 1972. 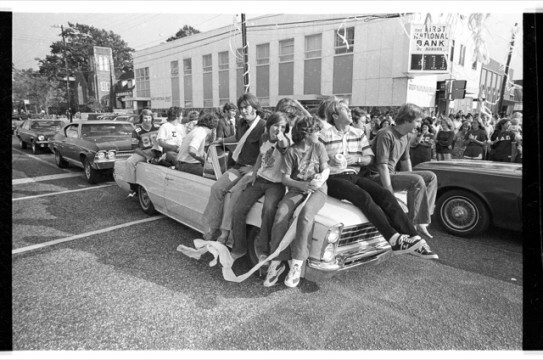 Though pre-80s rollings are said to have been reserved for road victories, these photos—again, going by the label on the sleeve of negatives—were most likely taken after Auburn’s 1972 home game against Georgia Tech. 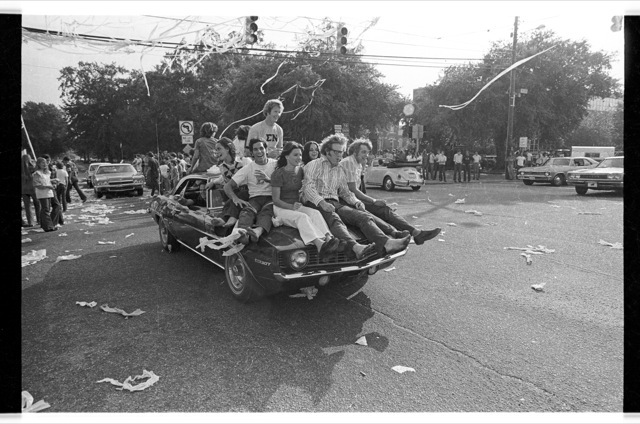 It’s one of the first substantial rollings of Toomer’s on record (though significant TP’ing occurred as much as a year earlier). Perhaps the decisive win after being down 14-0 early in the game or jubilation from bouncing back from a beat down in Baton Rouge the week before, Auburn’s only loss that season, was enough to break with the brand new tradition. Or maybe the away-game only rule wasn’t yet a rule. Or maybe nothing was yet a rule. 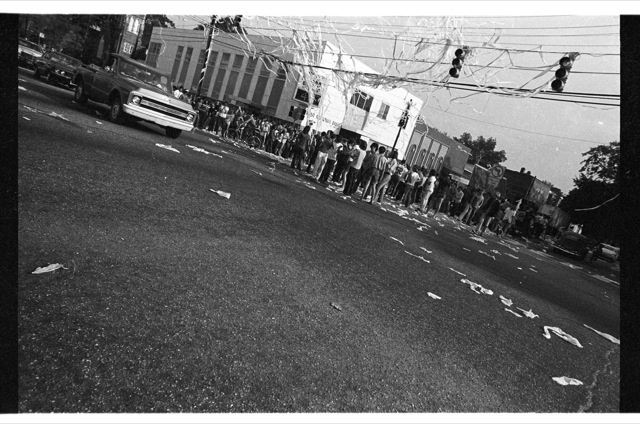 Whatever the context, whatever the exact date (and sure, whatever, we could be off by centuries*), we at least have six more examples of what the Click-it-Or Ticket-less orgies of toilet paper held in the historic center of Toomer’s Corner intersection looked like. And we have more coming soon—the only known (at least by us) color photographs of Toomer’s being rolled after the 1972 Iron Bowl [you can see black and white photos here]. A recommendation regarding the future of rolling the corner is scheduled to be delivered to Auburn University president Jay Gouge this week. * Maybe Larry Parker finished waited two weeks to finish off his Georgia Tech roll and these are from Auburn’s win over Florida in Gainesville. Because one thing that possibly suggests it wasn’t a home game is the casual garb. Not everyone was still coat and tie’ing it in ’72, but there was still a button-down formality to game attendance. Maybe these dudes just didn’t go to the game? If you spy any other context clues, let us know. I wasn’t in school in the early 70’s (hubby was), but I do seem to remember that it wasn’t the trees we tried to decorate, as much as those power lines in the intersection. 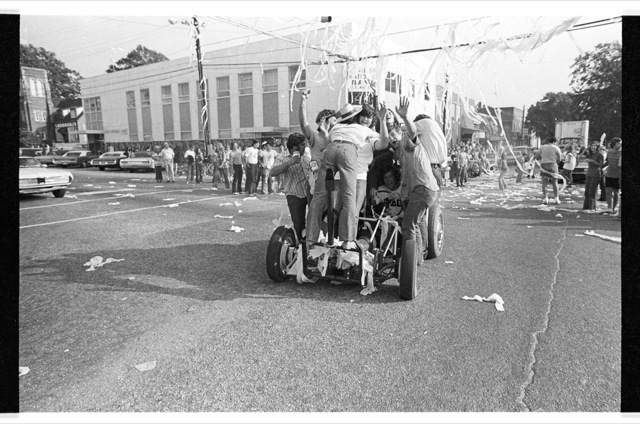 No one seems to get that it isn’t just an Auburn University victory tradition, it’s also part of our Town. And there are MANY Alabama grads/fans, who actually attended the University of Alabama and live in Auburn, that are as pissed off about this as the Auburn family. Not to be an elitist, because I’m not by any stretch, but going outside of “students/graduates”, from either school, but especially it seems the non-“students/graduates” of the Alabama variety, you get into the ones who live vicariously throught the Alabama football team. They’re scarcely aware there even are institutions of higher learning in Tuscaloosa or Auburn. They can’t be expected to know the impact these places have on peoples’ lives very, very far removed football. And that’s when you get maniacs running around pouring Spike 80 on trees. I’m no defender of Alabama, but when you remove football from the equation, Harvey not only took a dump on us, he did it to Alabama, Georgia, Tennessee, Floriday, Vanderbilt and every other instition you care to mention that strives to improve humanity. Thank you for continuing to chip away at the walls between us and greater knowledge of the Toomers’ Oaks history. Thanks, T.C. — really appreciate it.